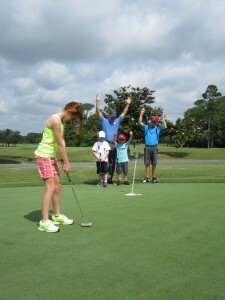 The other day, my daughter and I went to the golf course to work on our putting…. Of course, I didn’t tell her we were going to go ‘work’… rather told her were going to go play some putting games. Long of the short… we played 3 putting games, putted for 90 min and she wasn’t ready to leave. Games vs. Work… same thing, but packaging the golf as fun with a little competition was key. Kids have different lenses. If we just hit putts for 90 min, her experience would have been less than stellar. So parents (especially those with kids that already play golf)…. When you’re looking to reinforce a skill (where practice is required)… identify 3-4 games you can play that accomplishes this… also probably creates more focused practice – practice with purpose. We played 3 Games – #1 Game was 21 – which focused on distance control and rewarded the putter for getting the ball close to the hole. #2 Game was 7’s – which focused on both distance control and getting ball in the hole. And the #3 Game was “The Maze Game” – a new game that we made up that integrates getting the ball in the hole with a high level of creativity. Next time you work with kids or take your child to the course… challenge yourself to use words that have high level of meaning for children. Examples – Games, Adventures, Challenges, Rewards, etc. Also, I challenge you to incorporate the playing of Games into your practice. Can you elaborate on the games? How to play them? 7′s – goal is to get to 7, 2 points for make, 1 point for winning hole, -1 point for 3 putting.